Remember – this is for the ebook only. Enjoy! My new book is out! It is called Mastering ASP.NET Core 2.0 and was edited by Packt Publishing, as my previous one, Entity Framework Core Cookbook – Second Edition. Whenever there are important differences, I mention the differences between ASP.NET Core 1.x and 2.x, although I think this will be less important over time. Overall, it was an exciting task, but not one without obstacles. I must thank the team at Packt Publishing, namely, Siddhi Chavan and Abhishek Sharma for all their patience and support. Do have a look and share your feedback! It is available from the Packt Publishing site, Amazon and others, either in hardcopy or ebook format. The source code is available at https://github.com/PacktPublishing/Mastering-ASP.NET-Core-2.0. The good guys at Packt Publishing are at it again! Packt Publishing is celebrating the Machine Learning Week. 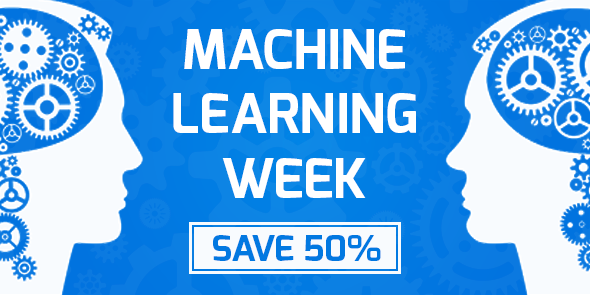 Machine Learning Week runs from Monday 18th January until 23:59 GMT on Monday 25th – throughout one will be able to save 50% on some of the most popular titles – such as Python, Java .NET and many more. Also, with a 50% discount on top titles, one can also pick up a 5-eBook bundle for just $50. Checkout link http://bit.ly/209h0lv! Again, Packt Publishing (@PacktPub) is doing a Thanksgiving sales! This time, you get 50% off on all buys happening from the 26th until the 30th of November – some days left, so hurry up! Check out http://bit.ly/1T9hMuv and save now! Back in June, we asked you what tech skills you were using most and what you were hoping to learn in the coming months. Over 20,000 of you replied and helped us to produce the most informative salary and skills reports of 2015. Almost 6 months later, we want to find out what has changed, to get your thoughts on the most important emerging tech for 2016 and to, ultimately, help you to Skill Up into a new year. Take our quick 5 minute survey and you will receive a code for buying any eBook or video for just $5!